Google showed an interesting chart yesterday at the first Google I/O keynote. 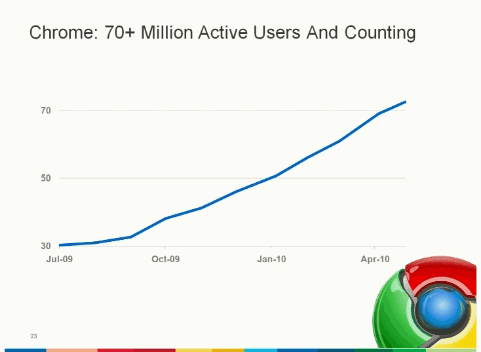 The number of Google Chrome users more than doubled in less than a year from 30 million users in July 2009 to 70 million users today. It's worth pointing out that this is the number of active users, not the number of Google Chrome downloads. Asa Dotzler has a similar graph for Firefox, which shows that Firefox grew from 265 million users to 365 million users in the same period. To put things in perspective, Firefox has 5 times more users than Google Chrome. It's a great achievement for Google and Chrome's market share will increase as the stable versions for Linux and Mac are released and Chrome OS becomes available. Even if you won't use Google Chrome, your browsers will be better because more people care about browser speed, process isolation and simple user interfaces. well congrats for chrome then.I personally find chrome browser to be less prone to crashes and much more stable than firefox.it's just that my firefox sometime crashed because of all that stupid addons. It depends on your configuration. I use Chromium, which is supposed to be less stable than the dev or beta versions, and it has crashed less than 10 times since it was released in 2008. Chrome has some helpful articles about crashes and you can also send crash reports by enabling a setting. well I just like chrome more and more. I've been using the dev version for quite some time and I *really* like it. before chrome I used to have several browsers installed but nowdays I just use chrome. fast, smooth and *very* stable. Your fine article prompted me to compare the two browsers’ growth rates: Chrome Heats Up Faster Than Firefox. I use Ubuntu Chromium build for all my Google Docs productions! Until now, I've not experienced any crashes! So, Kudos?